Hi all, I have been knitting a Tivoli Aran pattern. I have successfully made the scarf and now making the beret but I have hit a snag. I am having trouble interpreting the next step in the pattern. I would appreciate some help so that I can move onto the next step. As you don't actually say which bit of the instructions are causing you grief, I am really not sure how to answer your question. 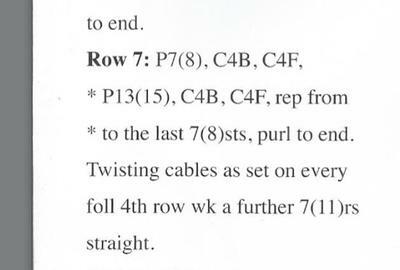 Twisting cables as set on every following 4th row wk a further 7 (11)rs straight. Next Row (8th row - ws): K7(8), P8, * k13(15), p8, rep from *to the last 7(8) sts, knit to end. Next Row (9th row - rs): P7(8), k8, * p13(15), k8, rep from *to the last 7(8) sts, purl to end. 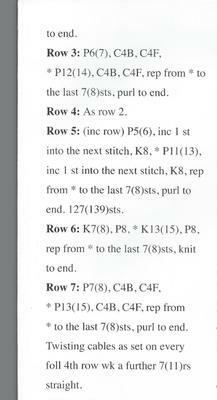 Next Row (10th row - ws): K7(8), P8, * k13(15), p8, rep from *to the last 7(8) sts, knit to end. Next Row (11th row - rs - Cable Twist): K7(8), C4B, C4F, * k13(15), C4B, C4F, rep from *to the last 7(8) sts, knit to end. Next Row (12th row - ws): K7(8), P8, * k13(15), p8, rep from *to the last 7(8) sts, knit to end. Next Row (13th row - rs): P7(8), k8, * p13(15), k8, rep from *to the last 7(8) sts, purl to end. Next Row (14th row - ws): K7(8), P8, * k13(15), p8, rep from *to the last 7(8) sts, knit to end. Stop here for the first size, continue as above for another 4 rows for the second size noting that the 15th row (the next row) is a Cable Twist row (so you would just repeat rows 11 to 14).